as the morning worm rises. You tuck straw around our eggs. And if you don't already have your copy of Responsive Pleading, what are you waiting for? Nudge. I bet we created these at exactly the same time on precisely the same day in out parallel lives. This is wondrous. By the way... this little painting is on a plane to Kerry in South Africa. How cool is this world? we belong together! and that's awesome, that it's en route to Kerry. perfect. Both the painting and the poem have my mind racing. A very nice pairing indeed. I *do* have a copy of Responsive Pleading, and highly recommend it! 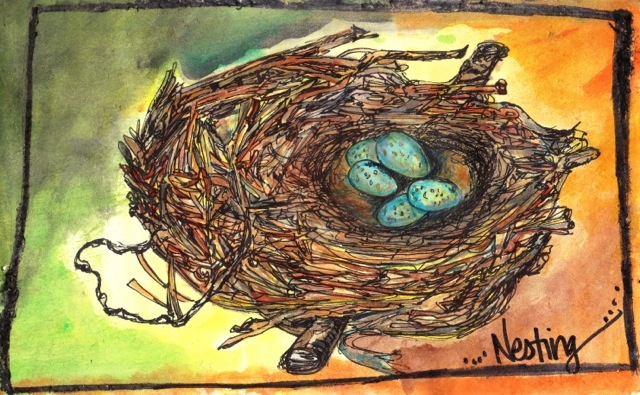 I love your pair of robins tending the nest, and Kim's painting is the perfect compliment. 'edge of contrary' is great--also the following line, and the sense of two being one. Beautiful words inspired by beautiful art, a perfect pairing.